Auction Closed. Sold via Buy Now $800. Next Action Monday July 10. Liberty Hill Farm in Rochester offers more than a great view. The hard working farm is also an Inn and gourmet food destination. 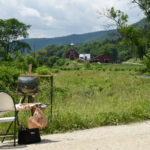 My artist friend Rae Newell and I were painting there last week. It was getting hot by the time the large woodchuck ran through my legs, under my easel, and down over the bank. I finished it up at the Middletown Springs Strawberry Fest yesterday, where I got my just desert. Please Note: Unless the “Buy Now” option occurs, this auction is scheduled to run for two weeks, until Monday July 10. I’ll be taking a few days off to spend with family. I hope you have a safe and happy fourth! If you are in the Ludlow area on Saturday July 1st, please stop by the Fletcher Farm School’s Annual Craft Festival and 70th Anniversary Celebration. 10 a.m. to 4 p.m.
I’ll be doing a painting demo from 10 – 11:30, when apparently I’ll be receiving the first “Robert Frost Award for excellence in artistry and art education”. While I’ve taken the last few years off from teaching to focus on my own work, the Universe, along with few others, have suggested the break’s about over. 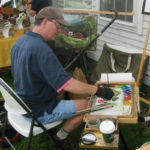 I saw Peter painting this yesterday at the Strawberry Festival inMiddletown Springs. Truly a nice experience to watch him use oils to paint this painting. My daughter lives in Rochester. 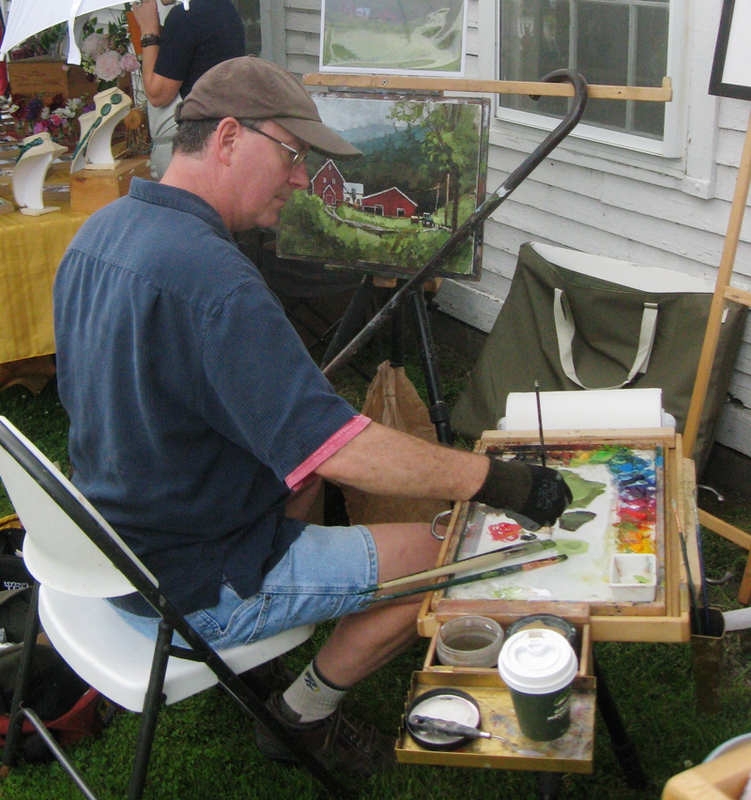 Your painting of Liberty Hill Farm is so pretty. I will definitely be checking this out the next time i visit her. I LOVE the painting, and the story to go with it! Thank you so much for sharing this stunning work of art and the photo of the venue, as well. I just love it. I don’t know who was more surprised, him or me. Thank you Cynthia! 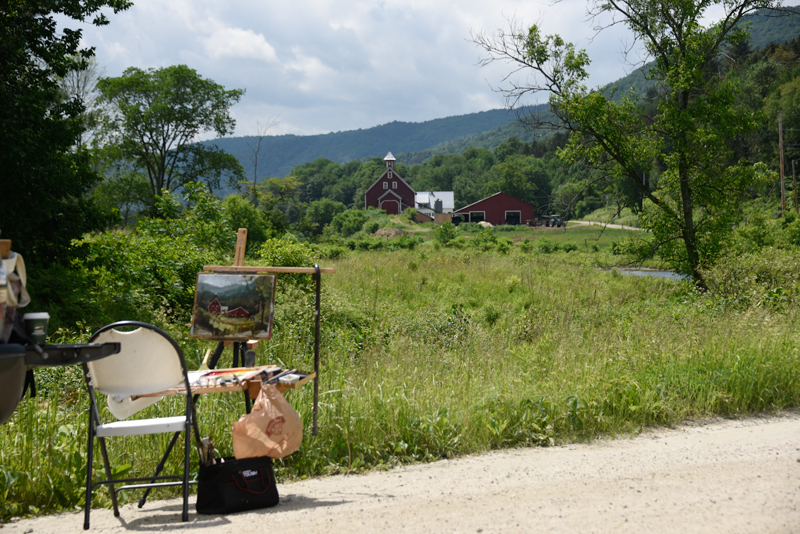 Another beautiful painting…another beautiful place in VT! Thank you! Watch out for the woodchucks!! Maybe he wanted to painted into the piece! Congratulations on the award! You must be so excited! What a career you have!!! Congratulations on the upcoming award!!! Another beautiful farm painting. I enjoy your work!! You did a splendid job of meeting the challenge of a lot of green elements by using a wide range of harmonious tones and values from almost yellow to a rich near-blue. Interesting shapes, texture, and a good sense of light and shadow enhance the foreground, while strong sunlight in the meadow and around the house and barn draw the eye boldly into the center of interest. 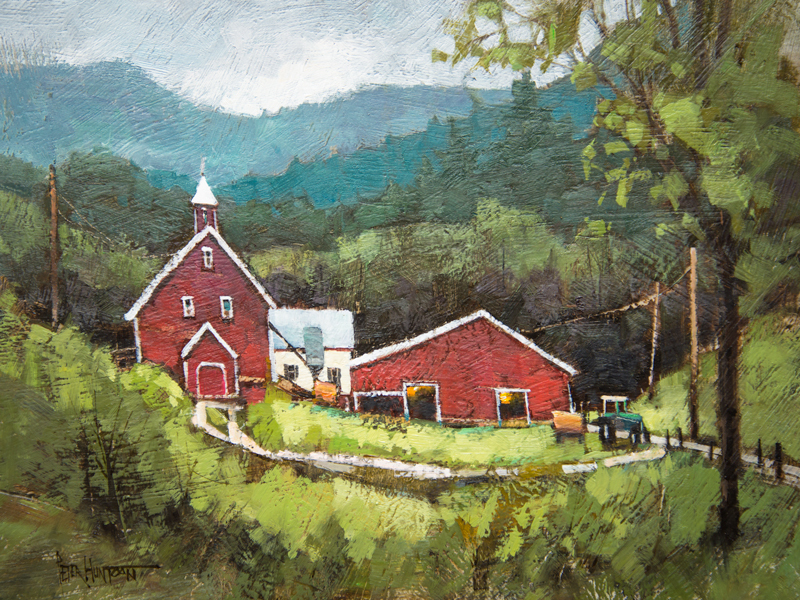 Few subjects provide an artist with more room to play with shapes, colors, and composition than a Vermont farm. Thank you Brian! Congratulations Peter, for receiving such a prestigious award. I don’t know anyone more deserving! Thanks very much Mary Fran, I probably wouldn’t have done much teaching without your “encouragement”! Sincere CONGRATULATIONS to you for the honor bestowed upon you as the first Frost award recipient. Well done, well deserved. And a commendation to those who selected you for getting the award off to a grand start. kudos to you from all if your friends here in central Florida. Aw shucks Michael, thank you very much! Love your work! Its so beautiful! Congratulations on your much-deserved award. Here I’m the poet, but you’re the one winning an award named for a poet! Loved your painting of the Tinmouth Channel that I saw you paint on your TV Program, A Day in Vermont.